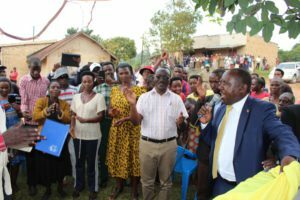 BUSHENYI – The Government of Uganda through National Water and Sewerage Corporation (NWSC) launched the Service Coverage Acceleration programme aimed at extending services to over 12,000 villages across Uganda by 2020. 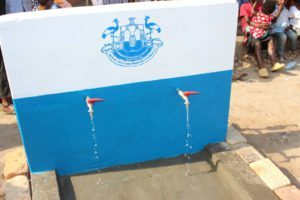 In the #SCAP100 programme, NWSC plans to: Extend water services to more than 12,000 villages; install 140,000 new connections; install 20 000 public stand pipes; and by 2020, have more than 8,000kms of water mains extensions in place. 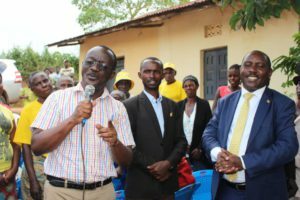 Under the same programme, Eng Silver Mugisha, the NWSC managing director, commissioned water mains extensions in Kyabumbaire and Kibaare villages in Bushenyi-Ishaka Municipality. He was in company of the Bushenyi-Ishaka Member of Parliament Gordon Cowboy Arinda and other area stakeholders. Speaking at the commissioning ceremony, Friday February 15, Eng Mugisha said that the 2kms and 9kms water mains extension to Kyabumbaire and Kibaare villages are in line with the SCAP 100 programme. He revealed the NWSC sells a jerry can of water at UGX25 only. “We recommend that water vendors sell a jerry can of water at only UGX50. Please report vendors who over price water,” he said. He appreciated the residents for the cost-sharing initiative. The residents offered to trench for themselves which made pipe laying easy. “We applaud the residents for the warm reception and cooperation while we worked to extend the services,” Eng Mugisha said. Area MP Arinda appreciated NWSC for successfully implementing government programmes by extending water to the municipality and other places. He advised the residents to use the water to improve their lives and health. NWSC plans to install at least two water points in every village by 2020 under the #SCAP100 programme.